All Tertiary Institution come together promoting TOURISM and its beautiful HERITAGE in their States, schools and community. Six states to visit and lunch Campus Tourism Queen by the brain box Mr Ideal Nigeria - Tourism 2012 Nnamdi Aziude. The States to tour are Calabar, Rivers, Delta, Lagos, and Akwa-Ibom, To start with his home town Enugu come October 2012 then Akwa-Ibom, Calaber, Rivers Port-Harcourt, Delta State, Lagos State. Places to tour for Enugu State (Coal City) are as follows: Igwe Nnaji Palace, Ngwu Forest for portfolio Pictures, Igwe Ojukwu Palace, Nike Lake Resort and Universal Hotel for Portfolio Pictures, IMT, Esut and UNN Enugu Campus, Then last day Fashion show/Pageantry with Crowning. You have the opportunity to represent your school at Miss University Africa 2013 MUA and Miss Omolewa Pageant Organized by Twitch and Styles Nigeria owners of Mr Ideal Nigeria not only that 1st prize go with cash prize worth five hundred thousand (#500,000) + plasma TV, 2nd prize (#200,000) + a flat screen TV finally 3rd prize (#50,000) + flat screen & generator. 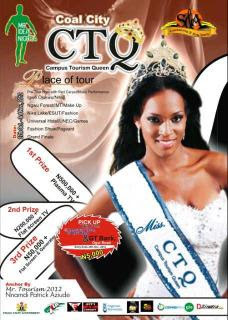 Proud partners/sponsors of Campus Tourism Queen "CTQ" October 2012. Mr Ideal Nigeria Tourism 2012 NNAMDI AZIUDE project.